As I sit gazing out the picture window watching the Ocean wave’s crash onto the flat sandy beach, I marvel at the peacefulness the beach gives to me. It continues to be a special place – an escape, a reward, and a place of rejuvenation and fun. My relationship with the beach began, as many things do, as a child. My grandmother, on my father’s side, lived at the beach (the rustic variety) each summer well into her 80’s. I am the youngest of nine cousins who all grew up with fond memories of clam digging, beachcombing, sand dunes, beach grass and drift wood; but probably most of all, a petite adventuresome Grandmother. My Grandfather, who unfortunately I never met, built the A-frame, fondly called the Tepee, with my Dad. I loved falling asleep in the Tepee to the thunderous pounding of the Ocean waves. We had the big house too, where endless family meals and games of solitaire were enjoyed by the light of kerosene lamps. Our beach was in North Cove in the State of Washington. It was a nice long, smooth, sandy beach with tremendous dunes. The area is now called Wash-away Beach because it continues to do just that! It has eroded 100 feet a year for a century – the fastest erosion anywhere on the Pacific Coast. At some point before I remember, we lost all power and plumbing in the houses as the Ocean moved closer. Pumping our own water, cooking on a wood stove, and using the little Tepee, aka outhouse, were all part of the charm. The cabins were moved to another spot in the 70’s before they were lost to the Ocean. At that point, I moved out of state and my immediate family was no longer involved in the cabins. However, the beach was a part of us all. Even today, I pay the property tax (a few cents) on the land several miles out into the Ocean. Funny that Pierce County continues to mail a property tax bill for land under the Ocean to a man that passed away in 1954. But, what if the currents change some day? For nearly two decades I lived elsewhere, mostly inland. I missed the beach and visited it when I could. 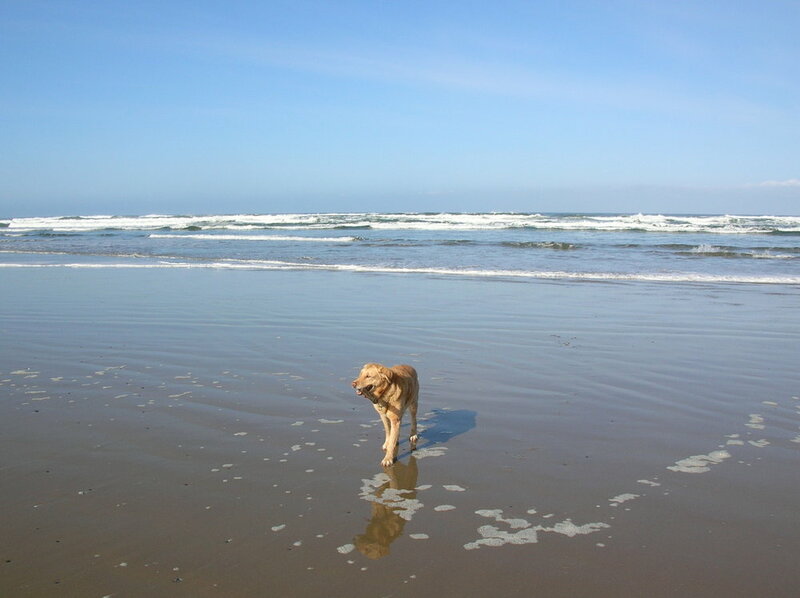 Once I was back in the Northwest, my then boyfriend and wonderful dog, Molly, a lab retriever mix, were heading to the Oregon Coast on a camping trip. (I guess based on that description, I was fonder of my dog than the boyfriend.) We stopped in a coffee shop in Hood River on our way out of town, where my boyfriend’s friend told us about a six mile long, flat, sandy beach with very few people at Nehalem Bay State Park. (All the beaches on the Oregon Coast allow dogs off leash.) We headed directly there and camped in the Park. It was wonderful to be frolicking on the beach again – especially with an obsessive retriever! I think the beach was Molly’s favorite place. When I broke up with this particular boyfriend, Molly and I enjoyed a sunny few days one February recovering from the relationship, sleeping in the car in the campground. The yurts for rent in the campground caught my eye. Cute, with electricity, heat, futon type beds and sofa, and deck, they are hard to beat – especially for the price. No dogs are allowed but Molly was fine hanging outside. The next trip, we upgraded from the car to the yurts. After I left my job as Vice President of Eddie Bauer, we escaped to the beach. For some reason writing Christmas cards from the yurt with Molly that December was the best! Even before Tom moved to Seattle and we bought our house, Molly and I took him to the beach and the yurts. May always seemed to be the month we would head to the beach – after ski season before the summer crowds arrived. Tom has now walked that six mile stretch numerous times himself. The long walks are a great way to contemplate something or just totally zone out. Lattes were only a one mile walk to the North in Manzanita. Breakfast and lunch in the yurts out of the cooler were fine. Dinner out in Manzanita or Cannon Beach was the way to go. The saddest trip was Molly’s last to the beach. Following her 100th birthday bash, we headed to the beach. In year’s past, she knew exactly where we were as we approached the beach. She couldn’t wait to get out of the car. She would run down to the beach and retrieve for hours if we let her, as we walked along the beach. She loved to frolic in the waves. This trip, I was hoping she would still get excited but it was hard for her to walk very far on the beach and she couldn’t get back in the car – made me want to cry. I think it was when Tom’s sister came to visit we started exploring options other than the yurts – they aren’t for everyone. We stayed in The Ocean Lodge south of Cannon Beach. Later we discovered Manzanita Rentals and finally upgraded to a real house with running water. Wow, a new experience for me at the beach after all these years! Tom’s niece and her husband enjoyed that trip with us – a block to the fantastic local grocery store and two blocks to the beach. The Merton Street house even allowed dogs but Molly was gone now – she would have enjoyed it. Once again, we headed back to the Merton Street house after moving my Mom into Assisted Living for some relaxation. This was when I totally zoned out and did my first jigsaw puzzle, ever. One day, we were walking to the beach and saw a rental flyer on a cute little house right on the beach (571 Beach Street). The next trip, we upgraded yet again to this cozy, remodeled house whose backyard is the beach! The only main street in town is just two blocks to the north. We love Manzanita, not only because of the same six miles of beach we enjoyed from Nehalem Bay State Park, but the town itself is wonderful with a few little shops, restaurants, and the friendly local grocery store. The zoning is such that there are no condos or timeshares here – a few motels but mostly single family homes. We have enjoyed the little house with my childhood friend and her husband – it’s a great escape for us all. Other friends sometimes stay nearby. In addition to the local beach walk, we have enjoyed the Neah Kah Nie Mountain hike, Acadia Beach to Hug Point walk, Short Sand Beach, along with the scenic Ecola Loop hike recently. (Thanks to Governor Oswald West, all the beaches in Oregon are public.) Sea kayaking in Nehalem Bay is very pleasant. The historic Nehalem Aquatic Center is great on rainy days. And, each time we head to the beach, usually in May and October, I treat myself to a rejuvenating massage at Longevity. We are lucky to travel a fair amount, but I always daydream about the next trip to the beach! I can’t wait to smell the ocean air, feel the sand underneath my bare feet, and hear the crashing of the waves or to sit in the lounge chair and watch the sun set over the horizon above the beach. We just returned from our October trip and I am already looking forward to the May trip. Maybe, just maybe we can sneak away and visit the beach this winter and gaze out the picture window at the crashing surf in a storm. Check out Five Coastal Walks You’ll Love Between Manzanita and Nehalem, OR for an additional Pacific Beach fix.